Joni performed solo at the University of Illinois for the first annual Farm Aid concert to benefit small farmers in the United States. The title cut of Mitchell's criminally overlooked 1985 album is pure poetry about putting profit above all - art, quality of life, human rights and simple humanity. People's greed will stop at nothing, she realizes: "It's dog-eat-dog, ain't it flim-flam man? ...you can lie, cheat, skim, scam, beat 'em any way you can." 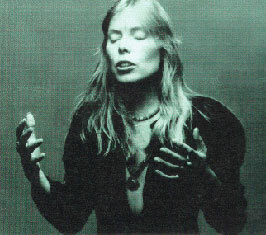 sorry for the typo's---I meant 'see signs' Joni Mitchell is becoming more understood....I also meant--Joni Mitchell is 'perhaps' as important to the world she lives in as any artist ever---this performance of Dog Eat Dog on piano 'lasts forever in 'its' powerful and helpful message to mankind. The second song is a stunning version of Dog Eat Dog. I love all she does and seek it....but this one made me write. The piano is beautiful! Her voice-spectacular. Her message--urgent, critical. She is so human and beautiful...by not being a glamour video nor being basked in major adulation and applause--this performance of the song lasts forever in it's powerful message. In looking for this video again, I saw there is an article in Reverb calling Dog Eat Dog one of the 13 best protest songs and that it was 'criminally overlooked.' Joni Mitchell is as important as any artist perhapes ever....that is what history will bring out in some era---though I seek signs that she is getting even more understood even in her lifetetime. I am glad she and the rest of us have waited long enough for understanding.